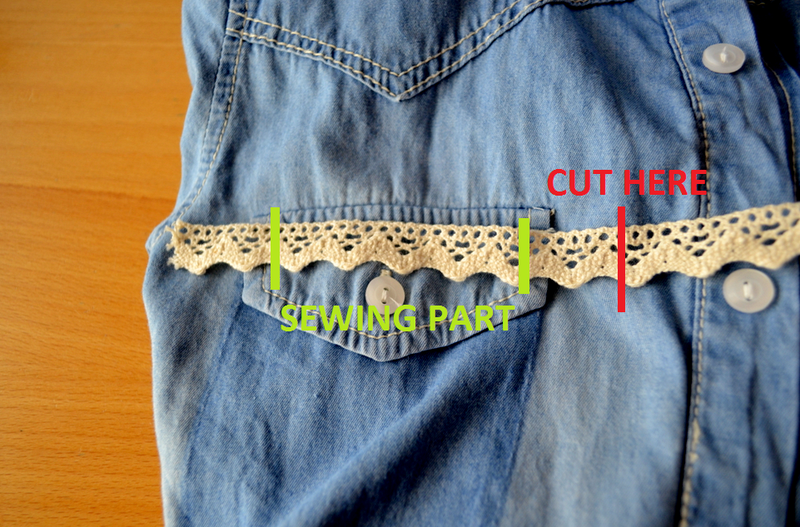 Today I will show you how to make your own lace denim blouse. 1. Lay the lace on the place where you want to sew it on. I am going to sew it on the pockets. 2. Now cut it like this..
4. And now you're done! what a great blog! :) you're very creative! thank you! I will really happy to keep in touch with each other! awesome DIY =) I just got a vest the other day and this looks great! so simple and so effective ! Your blog is absolutely amazing, I looooove it! I did an DIY on my blog today, changed my shoes. But this lace on denim thingy is great! I'm definitely a new follower! you have the most awesome DIY I've ever seen! Great post! It would be great if we followed each other! J'adore!Love your blog and all your other DIY ideas! Finally you found your diy with the laces! looks really good! Oh that is too cute!! I can't wait to pour over all your DIY's; I love doing projects like these. I am now following you hope you follow back! You are so cute! I love this.